Syngenta extended its SecureChoice Mosquito Assurance Program until November. Unlike other services that offer 21-day or 30-day mosquito control, the SecureChoice Mosquito Assurance Program provides control for up to 60 days, Syngenta said. With the combination of Demand CS insecticide and Archer insect growth regulator, this treatment can help reduce mosquito populations around customers’ properties for nearly three times as long, the company said. Demand CS provides immediate and residual control of mosquitoes, while Archer interrupts the reproduction cycle of mosquitoes. 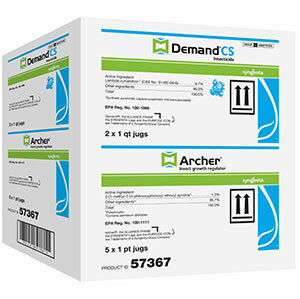 The Demand CS + Archer Multipak, which contains two quarts of Demand CS and five pints of Archer, can be used as part of the SecureChoice Mosquito Assurance Program. If applications of Demand CS and Archer fail to provide adequate reduction of mosquito populations during the 60-day treatment period, Syngenta PPM will provide the appropriate quantity of Demand CS and Archer to cover the necessary retreatment. Lawn care operators (LCOs) can participate in the program by purchasing Demand CS and Archer between Jan. 1 and Nov. 30, and by making applications by Nov. 30. Demand CS, Archer and the multipak also count as qualifying purchases for the 2016 PestPartners 365 Program, which offers yearlong rebate savings for LCOs who qualify by April 30.